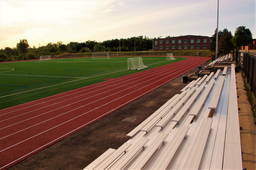 The field is available for rental from 8am to 11pm on Saturday and Sunday and from 6-11pm on weeknights. 4 x Small Sided Soccer Fields: 60m x 29.5m. All fields are permanently lined and have Kwik Goal premium quality goals and nets. Fieldturf’s Revolution 360 turf had been chosen for its combination of the best possible combination of playability, safety and durability. It meets both the FIFA Quality and FIFA Quality Pro testing standards and has been installed on the home fields of the Seattle Sounders, New England Revolution, Miami FC and Portland Timbers of the MLS and both Superbowl teams, the New England Patriots and Atlanta Falcons. Divider Nets: Divider nets are in place between 7v7 field but are removed fro full field play. 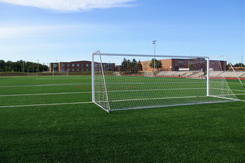 Small Sided Soccer Fields: $60 per hour including sets of small-sided goals and field divider netting.